I am a folklorist. To get here I survived a bachelor’s degree in cultural anthropology and a master’s in folk studies. The price to pay: countless hours spent conducting fieldwork, writing papers and studying; an obscene amount of student loan debt; a plethora of sleepless nights; thousands of photos taken; hundreds of books read; dozens of Mariah’s galaxy ice cream pie “therapy” sessions with colleagues; twenty pounds gained; and one comprehensive exam passed. It was a hard road, but I can honestly say that I’m glad that I took it. I could have made more money doing just about anything else, but that’s what makes this discipline special. We’re here because we really want to be. Folklorists joke about the prospect of making the first “folklore million,” but it’s really not about money. It’s about the love of life, culture, gestures, speech, food, tradition, beliefs, diversity and all the other aspects of daily life that can so easily be overlooked and forgotten. I’m honored to have the opportunity to use my skills as a fieldworker, writer, photographer and videographer to support, promote and conserve the traditions and culture that color the tapestry that is the Commonwealth of Kentucky. My primary goal since joining the Folklife team in January has been caring for and growing the Kentucky Community Scholars Program. The program trains community experts in the folklorist’s skills of conducting cultural surveys and applying what they learn in order to enhance their heritage tourism efforts and educational programs. Overall, the program is a beginning step for communities in documenting and presenting their cultural resources. The long-term result is a growing network of local cultural researchers who continue to learn from each other and share the results of their fieldwork with the people of Kentucky. To fulfill this goal, my first objective was to plan and implement a Community Scholar training session held in Louisville, Ky. at the Kentucky Center for African American Heritage in March and April. This session turned out to be one of our biggest and most diverse groups yet. In order to host this workshop in Louisville, the Kentucky Folklife Program partnered with the Kentucky Center for African American Heritage and the Jefferson County Public School System. Through this partnership, the Community Scholars Program was offered as a professional development opportunity for Jefferson County educators including Azucena Chamberlain, Harlina Churn-Diallo, Rosemaria Maum, Valeska McNeill and Lynette Taylor. 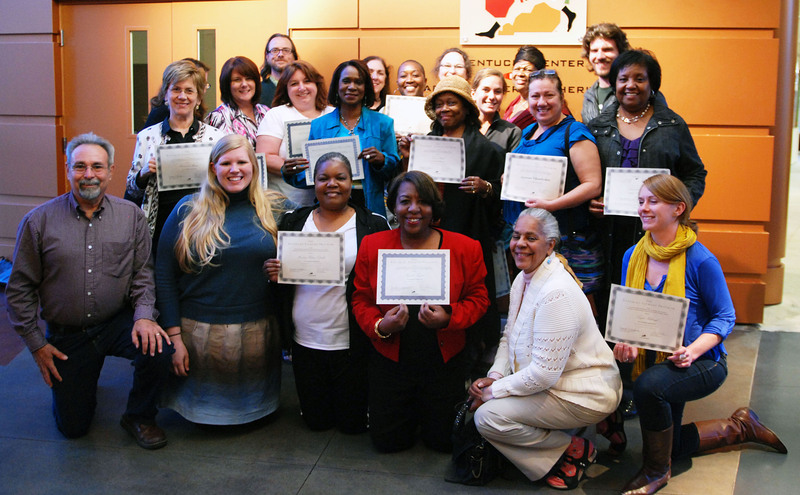 Two participants, Julie Barksdale and Rebecca Brown of Irvington, Ky., completed the course with intentions of using the skills they learned to conduct their own city-wide oral history called the Irvington Heritage Project. Other graduates included community members Marna Miller, Erma Bush, Casey Henry, George Eklund, Judith Owens-Lalude, Connie Harper, Stephanie Moyer, Tony Dingman, Scott Scarboro, Vicki Kastanis, Shannon Floyd, Taylor Killough, Maggie Poe and Mary Cartledge-Hayes. Each graduate completed the six-session workshop and fieldwork assignments, which included interviewing, photography, archiving, interpretation and presentation. Their projects topics ranged from urban agriculture, family history, writers groups, historic reenactment, dance, the Louisville Greek Orthodox community and folk art. Participants gained experience which can be used in historical societies, tourism sites, festivals, libraries and other community organizations and programs. Based on the passion, dedication and diligence presented by this group, I have no doubt that they will be capable of preserving aspects of their local culture and create positive, lasting change within their own communities. My secondary objective was convening all the graduates for a reunion. This program is twelve years old, and there are over one hundred scholars across the Commonwealth. It was time they all met face-to-face again. On Saturday, June 16, scholars met to gain new skills, share fieldwork and presentations and gain new insights into working towards community and cultural sustainability. As legacy of this meeting scholars have been invited to contribute blog posts about their work in their communities. Look forward to learning more about the great work they do in future posts on Creative Commonwealth.